Starting as Clinical Research Assistant in Canada — What do employers look at? Home / Clinical Research Essentials / Starting as Clinical Research Assistant in Canada — What do employers look at? Each year, Government of Canada spends more than 1 billion dollars to support innovative clinical research in Canada. Most of these funds are invested in Canadian universities-affiliated academic hospitals and research centers. The same centers also receive support from provincial healthcare funds. A typical research center employs over 1,000 research professionals, 70-80% of whom are clinical research assistants or coordinators. These positions are ideal for someone looking to start a clinical research career in Canada. Clinical research assistants are usually hired by the scientists or the clinical research coordinators. A typical candidate is someone who has completed an undergraduate degree in health or biological sciences and has some experience in clinical research. Providing this evidence of “experience” through your CV can be tricky if the candidate has not worked in a research center. The Clinical Research Essential® program of the Canadian Academy for Health Professionals (CAHP) can help you to bolster your CV. The program is based on the skills that scientists and clinical research coordinators are typically looking for. These include assistance in report editing, poster formatting, and creating figures using MS Office tools. Furthermore, the coordinators are looking in the candidate if they will be able to provide support in Institutional Review Board (IRB) or Research Ethics Board (REB) applications. This requires understanding of clinical trial protocols as well as IRB forms and consent forms. Lastly, the research assistants are expected to support the coordinators in updated CVs of scientists for funding application as well as helping with literature reviews. Prior experience in these skills can make or break your chances for securing an interview. Once you have secured at position in the academic research center, with experience, you will be eligible to sit in the credential examinations such as Society of Clinical Research Associates (SoCRA) or Association of Clinical Research Professionals (ACRP) that will allow you to secure stable jobs within academic or private clinical research organizations (CROs) or start your own CROs. For more details of how to start a clinical research career, please email us at info@cahp-edu.ca. Figure 1. 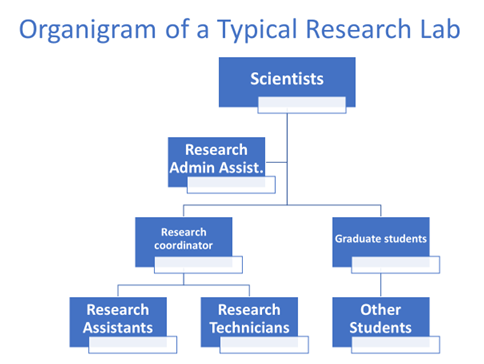 Research Assistant’s role in a research lab.